Why am I dredging up quantum indeterminacy or the observer's paradox again? You (whoever you are) may have recalled me posting about having my cat of 17 years euthanized back in July. A few weeks later, we received a call from the vet that I we could pick up her ashes. I numbly drove to the vet and waited as the same assistant who had put the IV to administer the drug to end my cat's life went and retrieved a small cardboard box housing the container with her ashes. I drove home with the box and opened it at home. Inside was a small wooden box with its lid sealed with screws. My children asked me if Bailey was inside the box. I explained that after she died, they had cremated her and the box contained her ashes. The original plan had been to scatter her ashes somewhere around the yard. But part of me wasn't too keen on the idea. Bailey had spent a bulk of her time at our house sleeping inside our bedroom. I don't think she ever actually went out in the yard. She'd been an outdoors cat years ago when I'd lived alone in a house in a different neighborhood. But I doubt if the current occupants would have been thrilled to have me show up and ask if I could scatter her ashes in their yard because my cat used to play their. Then my wife suggested we could just bury the box with her ashes in a flower bed outside. It seemed like a reasonable option. In the meantime I placed the box on my dresser in the bedroom where she'd spent her final years. And it has remained there. I still walk into the bedroom and expect to see Bailey curled up in her cat bed under the chair or on the bed. Occasionally I'll see a dark article of clothing at the end of the bed and think for a moment it is her. 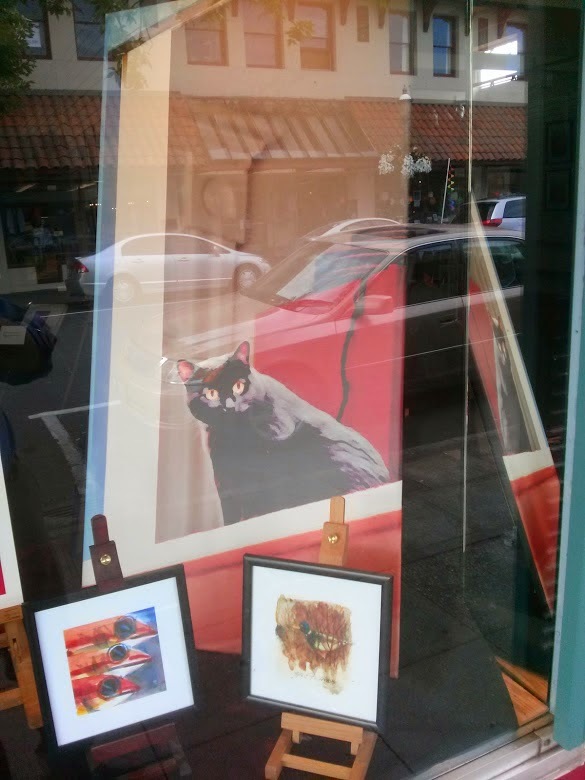 And I have started noticing black cat imagery like the photo at the top of this post that I snapped while walking by an local art gallery. My daughter took the death of Bailey the hardest. She told me she missed Bailey and wanted her to come back. This led to many discussions about life and death and questions about what happens to people and animals after they die. I tried to put a positive spin on it and say that our energy or spirit lives on and is reborn in other living things. It sounded good. But it prompted more questions about ghosts and spirits that I deflected with "there are no such thing as ghosts." 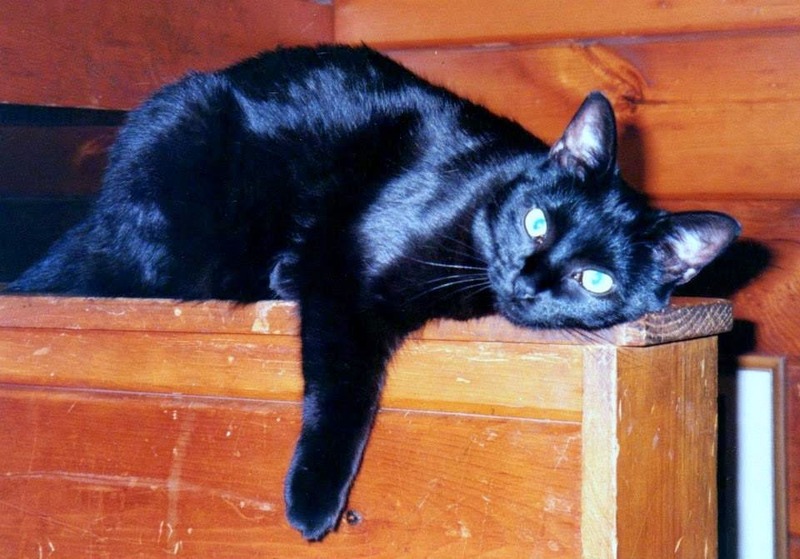 One day my daughter told me that she had been down in our basement playroom and she had heard Bailey meowing. She thought it was the ghost of Bailey. Then she said she hoped Bailey came back as a kitten to live with us again. I dismissed it. But several days later, I went downstairs to look for something in the family room next to the playroom and I distinctly thought I heard a cat meowing. It was brief and familiar. I didn't say anything to my wife or children about it. It could have been anything. The washer and dryer are down there and they always make sounds. Or it could have been one of our living cats meowing near a heat vent upstairs. But still...it made me think of Bailey's remains in the box on my dresser in our bedroom. And the box reminded me of Schrodinger's experiment with a cat in a box and the line: "It is only when we break open the box and learn the condition of the cat that the superposition is lost, and the cat becomes one or the other (dead or alive)." Maybe as long as the box remains sealed on my dresser, the possibility that Bailey's spirit is with us remains intact. Because once we open the box we lose all doubt whether she is dead or alive. Who am I to mess with quantum indeterminacy?